The number of rooms allocated for this offer is limited. Length-of-stay requirements may apply. Savings based on the non-discounted price for the same room. Additional per-adult charges may apply if more than two adults per room at Disney Value, Moderate, Deluxe and Studios at Deluxe Villa Resorts. Cannot be combined with any other discount or promotion. Advance reservations required. Offer excludes the following room types: 3-bedroom Grand villas, Cabins at Copper Creek Villas & Cabins at Disney’s Wilderness Lodge and Bungalows at Disney’s Polynesian Villas & Bungalows. 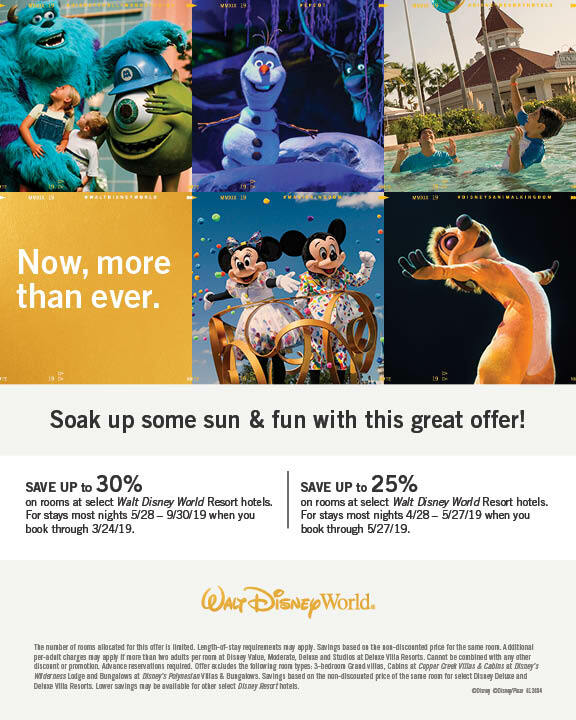 Savings based on the nondiscounted price of the same room for select Disney Deluxe and Deluxe Villa Resorts. Lower savings may be available for other select Disney Resort hotels. TO BOOK YOUR MAGICAL WALT DISNEY WORLD VACATION, CONTACT US TODAY!